Antidiabetic Medicine- Diabetes is a condition that can cause harm to the body. This capsule contains the goodness of several herbs that can control the condition. There are 8 herbs that are used to make this capsule. They are Gudmar (Gymnema Sylvestris) 100 mg, Kalijira ( Centratherum Anthelminticum) 50 mg, Amlaki ( Emblica Officinalis) 75 mg, Mamejva (Enicostema Littorale) 75 mg, Jambubeej (Syzgium Cumini Seeds) 30 mg, Giloy (Tinospora Cordifolia) 50 mg, Karela (Momordica Charantia) 25 mg, Kutki (Picrorrhiza Kurra Royle) 25 mg. Antidiabetic Medicine. Treat problems like hyperglycemia, obesity, high cholesterol levels, anemia and digesion. 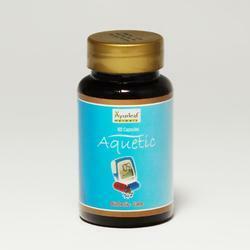 We offered a wide range of Antidiabetic Medicine. We offered a good quality of Karela Tablet (Momordica Charantia). 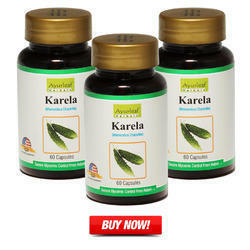 Karela is used in the treatment of diabetes I & II. It reduces the blood glucose level. It is believed that regular consumption of this bitter gourd will regulate the insulin level and ensures both blood and urine is normal. It purifies the bodily functions. Most physicians will recommend this remedy as a daily routine in the diet. Diabetes is a condition that can cause harm to the body. 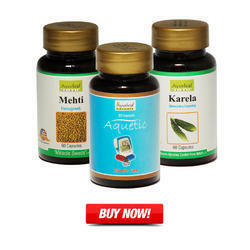 This capsule contains the goodness of several herbs that can control the condition. There are 8 herbs that are used to make this capsule. They are Gudmar (Gymnema Sylvestris) 100 mg, Kalijira ( Centratherum Anthelminticum) 50 mg, Amlaki ( Emblica Officinalis) 75 mg, Mamejva (Enicostema Littorale) 75 mg, Jambubeej (Syzgium Cumini Seeds) 30 mg, Giloy (Tinospora Cordifolia) 50 mg, Karela (Momordica Charantia) 25 mg, Kutki (Picrorrhiza Kurra Royle) 25 mg. This herb is also called Ram’s Horn. As a sugar destroyer (gurmar) and is most effective in diabetes. The leaves if this herb contains gymnemic acid that enables the reduction of excessive blood sugar. It has a regenerative effect on the pancreatic beta cells. It makes insulin also. Medically it is called Gymnema sylvestre/ Gymnema. It is a woody climber found in India and also Africa. 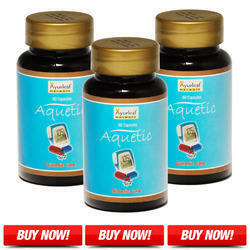 Description: The remedy inhibits hyper glycemia and gives the benefits of dhytochemical. Benefits: Regular usage of this remedy is recommended for diabetes patients who are unable to control their blood sugar. The other reasons it can prove to be effective is increase in metabolic syndrome, weight loss and cough. In ancient times it was also used for malaria, antidote for snakebite, laxative, stimulus for digestion, appetite suppressant and diuretic. Dosage: Two capsules needs to be taken twice a day with water before meals. 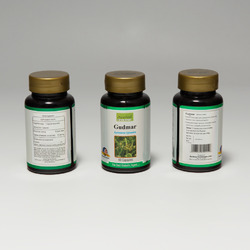 From our wide range of products we offer Bitter Gourd Capsule. 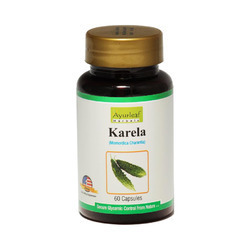 Karela is used in the treatment of diabetes I & II. It reduces the blood glucose level. 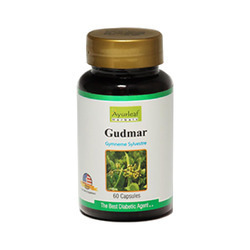 In Ayurveda, Gurmar is also known as Gymnema Sylvestre Extract is made from two words first is "GUR" that stands for jiggery, another one "MAR" for killing. A well-known Ayurveda herb that may kill the sweet buds of tongue is known as Gurmar. 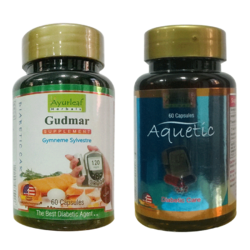 Gurmar is a specific herbal supplement for diabetes. It is used to regulate glucose levels, increase insulin levels, prevent sugar cravings and promote whole-body cleansing. After chewing the leaves of this herb, tongue is numbs to taste the sense of sweet or bitter, hence the translation of this plant's name is "sugar killer" or "sweet destroyer". It is the outstanding herb for balancing blood sugar levels. This is a traditional Ayurveda medicine used for more than 2,000 yearsand it grows in the tropical forests of India. Healthy aspects of Gurmar. 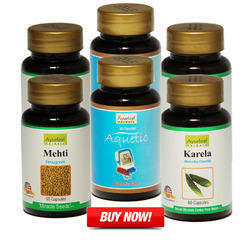 We are manufacturer and supplier of Ayurvedic Medicine.